Large numbers of prime sheep on offer at the pre Easter sale held on Monday with prices all round easier on the week. Spring lambs selling from 450 to 510p for a pen of Texels 21kg at £107. Lightweight hoggets selling from 420p to 452p for a pen of Charollais 21kg at £95. Heavy hoggets selling from £100 to £105. In the cast ewe ring Texels sold to £110. Charollais to £105. Suffolks to £100. Mules to £88 and Blackface ewes to £61. Prices: Crumlin producer 7 lambs 22kg at £109. Ballycarry producer 7 lambs 23.5kg at £108. Antrim producer 12 lambs 21kg at £107. Dundonald producer 11 lambs 25kg at £106. Ballymena producer 5 lambs 23.5kg at £105.50. Kells producer 6 lambs 21kg at £105. Crumlin producer 11 lambs 23kg at £104.50. Ligoniel producer 5 lambs 22.5kg at £104. Crumlin producer 8 lambs 21.5kg at £104. Ligoniel producer 7 lambs 21kg at £103. Moneymore producer single lamb 24kg at £103. 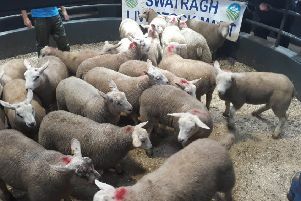 Ballycarry producer 2 lambs 22kg at £102. Templepatrick producer 19 lambs 22kg at £102. Saintfield producer 18 lambs 24kg at £101. Ballymena producer 10 lambs 22kg at £101.50. Ballymena producer 10 lambs 21kg at £101. Glenarm producer 5 lambs 23kg at £100. Crumlin producer 8 hoggets 32kg at £105. Dundonald producer 2 hoggets 31kg at £105. Portaferry producer 29 hoggets 32kg at £105. Portaferry producer 19 hoggets 28kg at £104. Randalstown producer 7 hoggets 27kg at £103. Ballyclare producer 4 hoggets 29kg at £103. Nutts Corner producer 14 hoggets 26kg at £102.50. Saintfield producer 4 hoggets 27kg at £102. Templepatrick producer 20 hoggets 31kg at £102. Ballymena producer 4 hoggets 24kg at £101. Cookstown producer 29 hoggets 30kg at £100. Carryduff producer 10 hoggets 30kg at £100. CAST EWES: Crumlin producer 2 Texels at £110. Dundonald producer 2 Texels at £105. Crumlin producer 6 Texels at £100. Kells producer 2 Charollais at £102. Dundonald producer 2 Texels at £100. Greyabbey producer 4 Suffolks at £100. Antrim producer 7 Suffolks at £96. Crumlin producer 24 Mules at £87. Ballymena producer 12 Mules at £88. Glenarm producer 6 Blackface at £61. Cushendall producer 4 Blackface at £56. The mart will be closed on Easter Monday (April 22).